A record-setting Russian spacewalk ended with a critical antenna in the wrong position on February 2 outside the International Space Station. NASA’s Mission Control reported that the antenna was still working. Nevertheless, Russian space officials were convening a special team to see whether further action would be necessary. The antenna is used for communications with Russia’s Mission Control outside Moscow. The trouble arose toward the end of the more than 8-hour spacewalk — the longest ever by Russians and the fifth longest overall — after Commander Alexander Misurkin and Anton Shkaplerov successfully replaced an electronics box to upgrade the antenna. The pair watched in dismay as the antenna got hung up on the Russian side of the complex and could not be extended properly. The antenna — a long boom with a 4-foot dish at the end — had been folded up before the repair work. NASA Mission Control said from Houston that the antenna wound up in a position 180 degrees farther than anticipated. 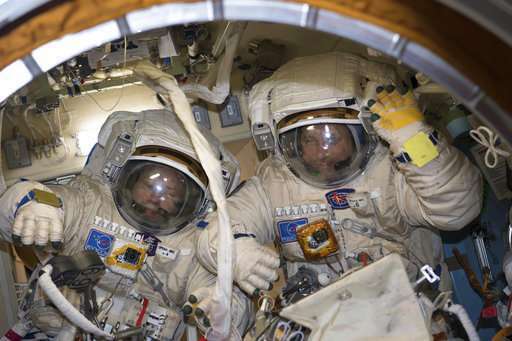 The spacewalk dragged on so long — lasting 8 hours and 13 minutes — that Misurkin and Shkaplerov ended up surpassing the previous Russian record of 8 hours and 7 minutes, set in 2013. It was supposed to last 6 ½ hours. “Are you kidding us?” one of them asked when they heard about the record. NASA still holds the world record, with a spacewalk just shy of nine hours back in 2001. Misurkin and Shkaplerov also asked flight controllers whether the antenna was operating “or have we just wasted our time?” The response: It’s being evaluated. It was the second spacewalk in as many weeks. On January 23, two US astronauts went out to give a new hand to the station’s big robotic arm. NASA had planned another spacewalk this week but bumped it to mid-February because engineers needed extra time to get the mechanical hand working. After removing the old, obsolete electronics box from the antenna — an original part, launched in 2000 — Misurkin shoved it away from the space station. The bundle tumbled harmlessly away, 250 miles above the North Atlantic. The 60-pound box — measuring just a couple of feet, or less than a meter — was hurled in a direction that will not intersect with the space station, according to NASA officials. While the Russians routinely toss old equipment and used towels overboard during spacewalks, NASA prefers to secure no-longer-needed items or, if possible, bring them inside. Except for SpaceX’s cargo ships, empty supply capsules are filled with trash and set loose to burn up in the atmosphere. The discarded electronics box will re-enter and burn up, too; Mission Control said it did not know when that will occur. Misurkin will return to Earth at the end of this month with two NASA crewmates.The space station is home to two Russians, three Americans and one Japanese.